Material: Main: Cotton / Elastane; Elastic: Nylon / Elastane. Kids Legging is rated 4.7 out of 5 by 20. Rated 5 out of 5 by LauraM from Great product but... I have been buying “girls” leggings for my 3 yr old son, he loves the bright colours and interesting designs. They stretch and bend with him while he plays, giving him the freedom to move and twist in any direction. Unfortunately they do not have these in the boys category over a size 2. Rated 4 out of 5 by LauraM from Bought for my son! I am a little annoyed that the boys leggings stop at size 2, as they are perfect for his active lifestyle. So I bought the girls leggings size 3. They are great, but he still wears a nappy, so the bum size is a little smaller than I would prefer. 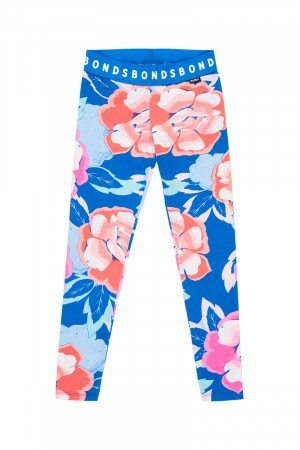 Rated 5 out of 5 by Zoe81 from Bright & beautiful I love the bonds leggings for my little girl, they are always bright, beautiful and long lasting. The patterns are always good with so many to choose from I always get stuck on which to buy. Rated 5 out of 5 by Pambo from I bought 2 pairs of leggings for my 3 year old granddaughter - she loves them, said they are nice and warm on her legs! !